Locking drawer with pull out shelf. Security drawer to store valued equipment and stored under top shelf when not in use. 191/2“(W) x 18″(D) x 5″(H) - For 4226 Series (Model #: DRW 4226). 283/4“(W) x 181/6“(D) x 5″(H) - For FDC/FDCAB 4418E. 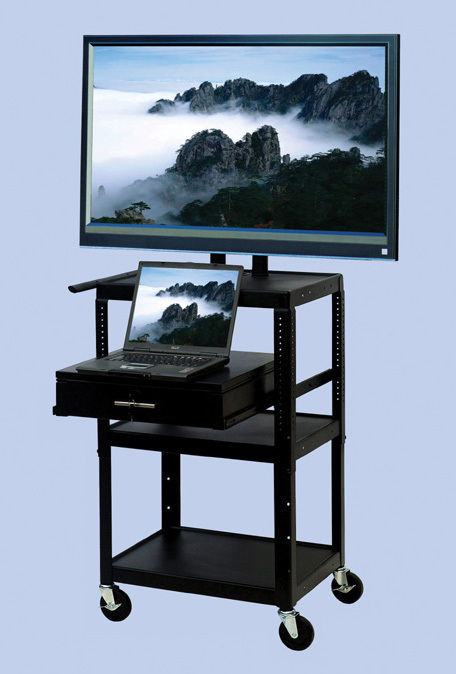 Shelf can be pulled out from front or back for laptop and/or presentation need. Pull out shelf size: 191/2” (W) x 18″ (D). Come with UL listed/CUL approved 15’ cord, 4 outlets power strip with surge protector and cord winder.